And receive a crown from the hand of the Lord. Alexander was a young Orthodox Christian from Thessaloniki who was sent to Smyrna by his parents who sought in this way to protect their son from the local Muslims. Unfortunately, however, Alexander did come under the influence of the Muslim faith and accepted Islam. Moreover, he later made a pilgrimage to Mecca and even became a dervish, that is, a member of a Muslim monastic order. It was not long, however, before his conscience began to trouble him. He found he could not tolerate the position he was in, that is, he could not stand by silently while Orthodox Christians, to whom he still felt related, were persecuted. To lighten the burden of his conscience, he began to feign insanity. While playing the role of a madman, Alexander tirelessly rebuked the Muslims for the injustices they committed against the Christians. Later, while in Egypt, some Muslims from the island of Crete plotted to murder him because, as time went by, he sounded more and more like a Christian and less like a Muslim. Before their evil plans could be carried out, Alexander left Egypt and returned to Thessaloniki. Later he went on to the island of Chios where, still dressed as a dervish, he began to attend Orthodox services, and he continued to preach to the Muslims in Chios, beseeching them to act with justice towards the Orthodox. "Mulla! I was an Orthodox Christian and because of my foolishness I denied my faith and became a Muslim. Later I realized my former faith was light, which I lost, while your faith, as I have come to know it, is darkness. So I have come before you to confess I have made a mistake by denying the light and accepting the darkness. I was born an Orthodox Christian! I want to die an Orthodox Christian! Behold, you have heard my decision, Mulla, now do to me whatever you wish, for I am ready to endure every torture and to even spill my blood for the love of my Jesus Christ, whom I wrongly denied." After these words were spoken, Alexander took off his Muslim head covering and replaced it with a Christian one. Those present in the courtroom could not believe their ears. In fact they thought they must be listening to a madman. But one by one, beginning with the mulla, they began in a soft sympathetic voice to tell him he had spoken unheard of things, and perhaps he was not well and should come to his senses. How could he, a dervish, shame his religion and his integrity in such a manner? To all of these remonstrances, Alexander responded: "It is true, I was out of my mind, but now frankly I have come to my senses and I confess my iniquity. You say, because I am a dervish, how do I say such things? I truly speak the truth, for I have gone to your Mecca, and have examined all of your faith, and I have understood everything about it to be false and abominable." The Muslims present responded to Alexander's declarations by saying he must be drunk, and as such they had him put in prison. On the following day when more Muslims gathered around the mulla, Alexander was questioned again but with the same results. The Muslims felt embarrassed that one of their best, a dervish, could renounce Islam and therefore tried very hard to persuade him to give up the notion of returning to Christianity. They began to flatter him with soft soothing words, reminding him of his position, his integrity as a dervish, and the thought that it would be a pity for him to sacrifice his youth, his very life. They offered him money, clothes, anything he might wish, but none of this made an impression on Alexander who was determined to witness for Jesus Christ and suffer any and all consequences. "O how foolish you are to bring up death. I came here for this purpose, to die for the love of my sweetest Jesus Christ. You are trying in vain to change my unwavering decision with your deceiving threats and your insignificant promises. As for myself, I think of dying for my holy faith which I wrongly denied and to die to this false life and to gain the other, the eternal one. I was born an Orthodox Christian and I wish to die an Orthodox Christian. This is what I desire, this is what I thirst for. So you do whatever you wish. I am ready to suffer everything for my Master Jesus Christ." Alexander was returned to prison where he stayed until Friday, a Muslim holy day on which it was customary for the important Muslims of the city to gather about the kadi of each city and attend with services at the mosque. On this occasion, Alexander was the topic of their conversation. When brought before the kadi for the third time, the same flattery, promises and threats were made. To these Alexander replied by simply saying: "I was born an Orthodox Christian, I wish to die an Orthodox Christian. I will not exchange the light for darkness. I worship Father, Son and Holy Spirit, Trinity consubstantial and undivided." Saying this, he made the sign of the cross. This was the last straw for the kadi and the Muslims present. Alexander was immediately sentenced to death. He was bound and led to the place of execution accompanied by many Muslims who continued to try to persuade him to change his mind. To their admonitions, Alexander responded, "I am an Orthodox Christian and I die as an Orthodox Christian." Many people, Muslims, Orthodox Christians, Westerners and Armenians gathered for the execution. Alexander stood in the center. The executioner then placed his sword in front of Alexander's eyes to frighten him. But the Neomartyr remained calm and unaffected. Alexander was then ordered to kneel, at which point the order came from the mulla for a stay of execution. The stay continued for an hour during which time Alexander prayed. When he gave no sign of changing his mind or of being willing to convert, the execution proceeded and he was beheaded. Thus Alexander the dervish from Thessaloniki sacrificed his life for the love of Jesus Christ in the city of Smyrna, Asia Minor on May 26, 1794. From Witnesses For Christ: Orthodox Christian Neomartyrs of the Ottoman Period 1437-1860, by Nomikos Michael Vaporis, pp. 217-219. In lawful contest O Martyr you were valiant, you were wounded after prevailing against the enemy, and you are seen Alexander as a companion of Martyrs. Therefore as its holy offshoot, Thessaloniki honors you, and with longing it proclaims to you: Do not cease interceding for the mercy of those who honor you. The city of Thessaloniki celebrates today your holy memory, Alexander Neomartyr; you are its own divine offspring and offshoot; you contested in Smyrna with brave resolve for love of the Lord; therefore entreat Him that He may save us all. 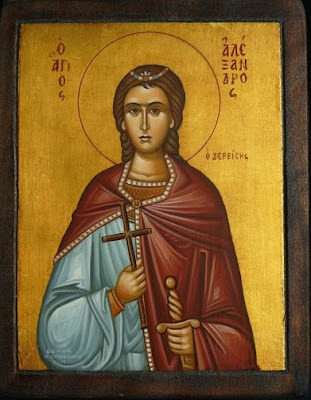 You contested lawfully for Christ, Alexander Martyr, and destroyed the enemy; therefore Thessaloniki reverences your memory, honoring your struggles and your contests.